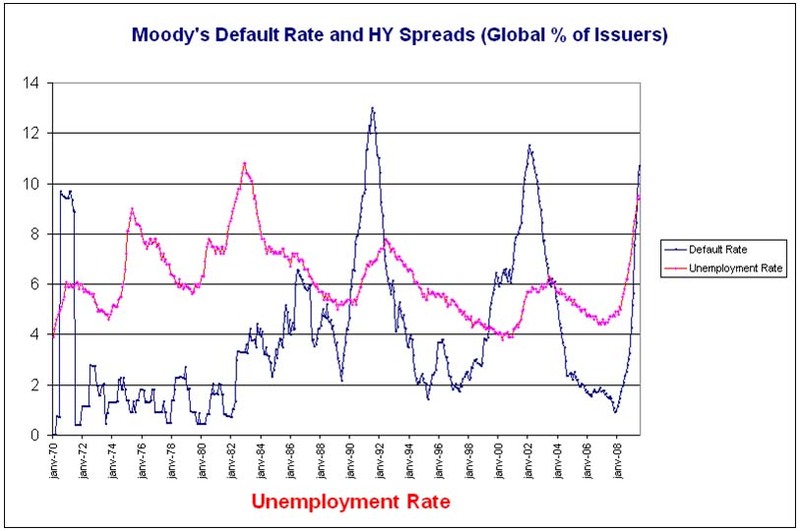 Yves does a terrific job of tying UNEMPLOYMENT TO DEBT. That’s right, as debt goes up, unemployment goes up, or employment goes down. This is a huge flaw in the thinking of the deficit spending crowd and is actually a phenomena of our interest bearing debt backed money system. Spend and pretend, spend and pretend. Yves goes on to project three possible scenarios. Keep in mind that his figures are in terms of modern day BLS U3 BS. U6 unemployment, of course, is already 17.5%, more than 7% higher than U3. Thus, his case 3 scenario of 15% unemployment would equate to about 22% or more in U6, the measurement most like how it was measured during the Great Depression. Personally, I think his case 3 scenario is a shoe-in, and my case 4 would be more like 18% U3 and 25%+ U6. It may not get there in a straight line, but until and unless our money system is fundamentally fixed, each future cycle will produce higher highs. Thanks for sharing with us, Yves! Most participants these days should take the “thinking outside the box” more seriously. With this in mind, I have studied the behavior of default rates and high yield spreads. In doing so, I also discovered that the general YoY growth in the GDP was mainly going down. The resulting effect on unemployment should then be obvious. I show in the first graph the result of higher debt having a diminishing effect on labor. 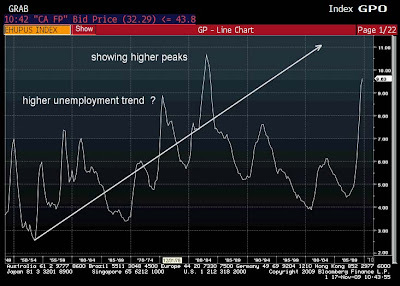 You notice that like a weaker GDP trend would suggest, the rate in unemployment shows higher peaks from the 1950’s onward. It would not be surprising that we exceeds the 1985 peak close to 11%. 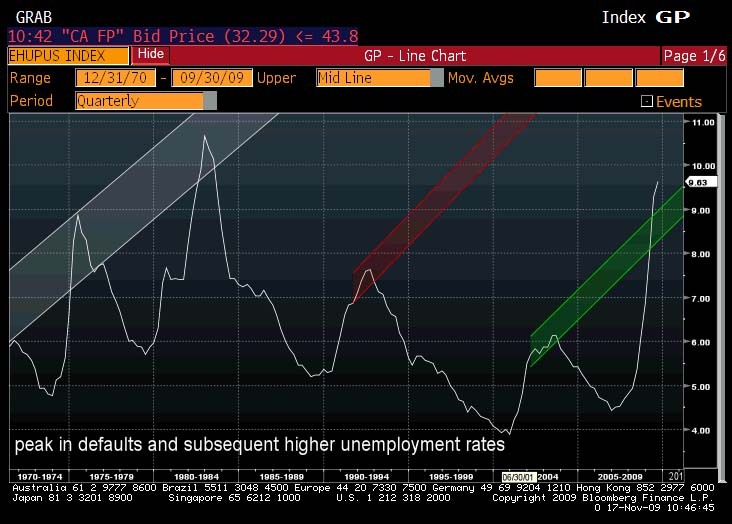 The graph of unemployment with the default rates is meant to show that the rate of unemployment will continue upward for some time once default rates have peaked. You will see this in the 1980-1984 period, the 1990-1994 period and lastly the period of 2000-2004. These are times very similar in each starts of decades, coincidence? The basic assumption generated with this study results in a rate of ascent in the rate of unemployment once high yield default rates peaks. I will have applied an average of these three periods discussed going forward in our three base cases. This rate of ascent is shown in the graph with the subsequent higher unemployment rate. 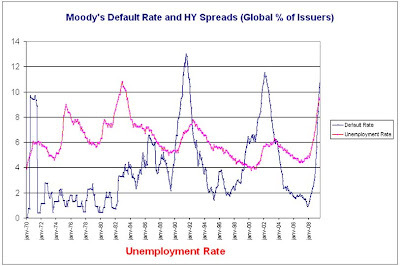 It does carry upward for some time and will lag the turning point of the high yield default rate peak. Lastly we provide an overview of my unemployment projections based on three scenarios. 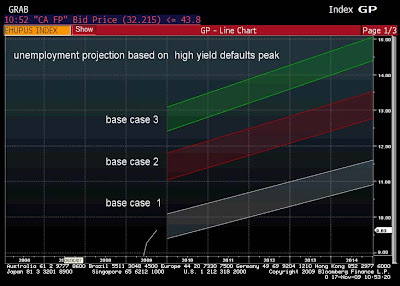 The base case number one takes the view that high yield default rates are peaking and will start to drop from this level now. 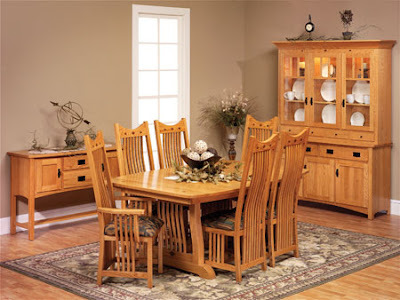 The rate of unemployment ranges from 10% to 11.5% with this given scenario. 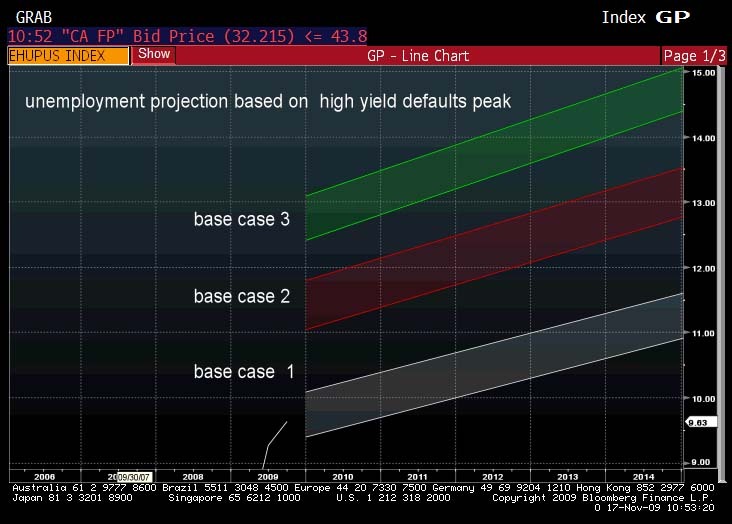 In the base case number two, I am using a composite of both peaks in 1991 and 2002 to suggest that default rates may carry upward one percent more. The resulting effect on unemployment targets will range from 11% to 13.5%. In our final analysis base case number three will use the peak at 13% in default rates established in 1991. 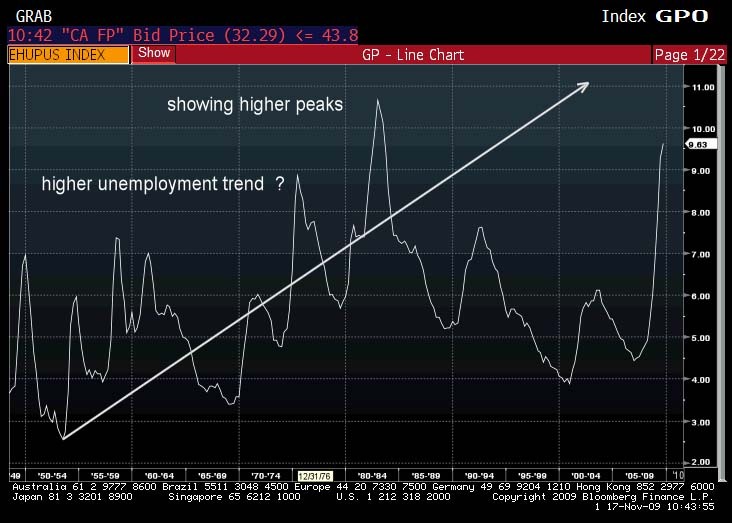 Unemployment rates in this scenario show a range of 12.5% and 15% before possibly peaking. In exploring various thesis, I seldom have a psychological prejudice. I suggest people doing pseudo-finance do the same. - Yves Lamoureux, Investment Advisor , Blackmont Capital inc.